Homemade Avocado Face Masks are amongst the best natural face masks that are known for nourishing and revitalizing the skin. This fruit is packed with skin friendly minerals such as iron, calcium, potassium, copper, magnesium, etc., vitamins A, E, B and K and unsaturated fats. In this article, you will find how to make an avocado face mask at home. 2. Face masks using avocado as an ingredient are good for those who are having acne prone as well dry or sensitive skin. 3. The avocado face mask can reach the inner layers of the skin to impart elasticity to even the extremely dry skin. 4. They work wonders to slow down the aging process. 5. They are inexpensive and can be easily made at home using the natural ingredients easily available in your kitchen cabinet. Read on here for some incredible homemade avocado face mask recipes to clean skin pores and soothe your dry skin. 1. Avocado Honey Face Mask: This easy to make face mask for dry skin uses only 2 natural ingredients, namely, avocado and honey, both of which act as natural moisturizers. This mask works wonders for mature, wrinkled and dry skin. Take 1 fully ripe fresh avocado, remove the skin as well as the seed, and mash it up into creamy pulp in a bowl. Add 1 tablespoon of honey and stir the mixture until it turns into a uniform paste. Apply to skin and leave it on for 10-15 minutes. Rinse off the mixture with lukewarm water and pat dry your face with a soft towel. This avocado mask recipe works to impart a beautiful glow to your face. This face mask is not too sticky, but it is delicious! 2. Oatmeal Avocado Face Mask: This acts as a great moisturizing mask and helps in restoring damaged skin. Take 1/2 ripe avocado and 1/2 cup of oatmeal. Cook the oatmeal as per instructions in the label on the oatmeal packet and mixed it well with the mashed avocado (without its skin and seed) until it turns into a pulp-free paste of uniform consistency. Apply it on your skin and leave it on for 10-15 minutes or until it dries up. Once it’s done, rinse it off with lukewarm water and pat dry your skin with a soft towel. 3. Avocado Yogurt Face Mask: If you want to pump in moisture into your skin then this mask will do the trick. Yogurt also works well for acne prone skin because it has lactic acid that kills bacteria. As the plain yogurt is a little acidic, it works to restore your skin’s pH balance as well. This work great in winter months. Take 1/4 ripe avocado and mash it up in a bowl until it turns lump free. Mix into the pulp 1 teaspoon of plain organic yogurt and 1/2 teaspoon of honey. Stir them well until you get a paste of uniform consistency. Apply the mask onto your skin for 10-15 minutes or until it dries out. Rinse it off with lukewarm water and pat your skin dry with a soft towel. Natural Beauty Tip – In case your skin is oily, go for a lower fat content. 4. Avocado, Banana and Egg Face Mask: Take 1/2 ripe / soft avocado, 1/2 ripe banana and 1 egg yolk. Mash and mix all the ingredients together to form a paste of uniform consistency. Apply on your skin and leave it on for 10-15 minutes. Once done, wash it off with lukewarm water and then pat dry your skin with a soft towel. Now you must have observed how easy it is to make and use these DIY Avocado Face Masks. They are inexpensive and chemicals free. You can apply any one of them once a week and watch your skin getting young and beautiful. (i) The above additional ingredients are optional. The avocado face masks are effective even when they are made with avocado alone. The optional ingredients you may add for their specific additional properties that may promote skin health. (ii) Use a soft and ripe avocado for the purpose of making face masks. 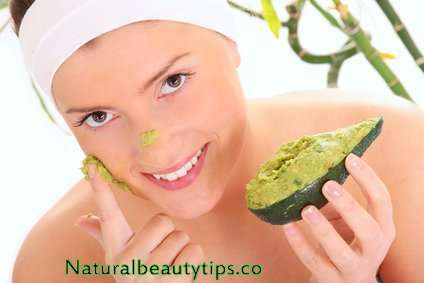 (iii) To make the avocado mask cool and refreshing, keep it in your fridge for a couple of minutes before applying it. (iv) If you add an egg to a face mask, the mask will work to tighten your skin. (v) To make the mask ingredients penetrate deep into your skin pores, wash your face with warm water before applying the mask. (vi) A tip for the people who have extremely dry skin. Add a couple of drops of olive oil to make the avocado face mask even more moisturizing. (vii) Wash your face with warm water to remove make up and dirt before applying any mask, so that the face mask provides the best results to you. (viii) Do not use any ingredient, if your skin is allergic to it. (ix) Avocado can stain your clothes, so wear an old T-shirt while making or applying an avocado face mask. Please give your views under comments below about this article. Take 1 fully ripe fresh avocado, remove the skin as well as the seed, and mash it up into creamy pulp in a bowl. Add 1 tablespoon of honey and stir the mixture until it turns into a uniform paste. Thank you for these lovely tips I always knew about Avocado and egg York masks but mixing it together this is awesome thank you! Just tried advacado and olive oil skin feels soft and looks instantly smoother. Just combine mashed fully ripe avocado and olive oil together to make a spreadable paste. Apply to your face. Keep the mask on until it dries a bit, approx 10 minutes, then rinse off with lukewarm water. If I don’t use all of the mask in one application, can I refrigerate or freeze what’s leftover without the mask losing its effectiveness? Thank you for your post. How many times a week do you recommend I should apply the mask? Or should it be daily? Thank you! You can apply it 2-3 times a week..
My face is always oily. Which of this application will be good for my oily face? I love Avocado masks..thanks c.f. or the recipes and the tips..can’t wait to try them..
Store the left overs in cool, dark place (your refrigerator)..
I’ve noticed you suggesting application a couple/few times per week. Couldn’t the avocado/honey mask be used nightly? Use it once or twice a week. You can try it at night, if it suits you. Thanks for your appreciation. Please share this site with your friends and relatives…..
hi. i just did the avocado, honey mask and noticed i started breaking out in small pimples around my chin, my nose and side of jawline. Not sure if it was the honey or avocado that was sensitive to my skin. I thought s mask would be good for smoothing out, but did the opposite and i still have crows feet undermy eyes, and more of these weird age bumps near my eyes too. im not as beautiful as years ago. Im in my 30s. How long does the avocado last in the refrigerator when it has egg? I am trying it with duck yolks does that make a difference? Duck egg yolk has higher concentration of nutrients and more protein than the standard hen’s egg. So, you can use duck yolk if you want. Preferably, you keep an avocado mixed with an egg mask in refrigerator and use it within a day. Otherwise, it can start giving a foul smell. How do you keep the remaining mix from drying out? You can keep the remaining mix in refrigerator for few days. Please check before using it that it does not smell bad. I have always applied an avacado and evoo face mask nightly as it doubles as my night moisturiser…l have a form of severe irratant allergy who ha and not able to use store bought products..My skin is flawless and wrinkle free and l am 55…l only put on my skin what l can eat…cleanse with water only and exfoliate gently with organic ground coffee beans…Mornings l apply a little evoo…trust me your skin will thank you as will your wallet. Thanks for sharing your tips.. Thanks Janet for your useful tip. Can wait to try them all, thanks for sharing! How often do I apply? Everyday? The days I DON’T apply the mixture do I use normal face moisturiser? You can use these masks 2-3 times a week. The day you don’t apply these mixtures, you can use normal face moisturiser. Does avocado mask reduce redness on the face ? Avocado contains high oleic acid content, Omega-9 fat. This skin friendly element works to regenerate damaged skin cells and reduce facial redness and irritation. Will something happen if I stop using this for a week..? Yes, you can do that. Nothing will happen. Avocado is a rich source of unsaturated fatty acids, vitamin E, oleic acid and other compounds that help soothe and heal skin tissues.Spreading a mashed avocado on your skin might help heal skin damaged by hyperpigmentation. please could you explain me clearly,i have a question .Mine is oily scalp dry hair,can i use AVOCADO for hair ? If you have oily scalp you can apply the avocado hair mask 1 to 2 inches away from the hair roots. Can wait to try them all, thanks for sharing !!!!! What about using lemon juice with mashed avacado? Lemon juice helps lighten skin pigmentation spots. Thanks. Thank you for the great advice, his may I add is also good with raw coconut oil when mixed together with the avocado. Skin feels beautiful. I am glad to know that your skin now look beautyful..
can avocado banana and eggyork face mask reduce pimples?